A little while after I arrived home from work the other day, my wife asked me if I had ever heard of ‘Animoto’. I gave her an odd look in response because on my commute home I repeatedly found myself behind a black car with the license plate ‘ANIMATO’ Fortunately, Animoto is a website that allows you to easily create dynamic slideshows from your pictures and video files and then add captions and background audio not the keyword in a me-centric conspiracy. I hate the term slideshow because it reminds me of all the instances in 80’s/90’s sitcoms when the main characters would get trapped watching their neighbors’ slides about their vacations or kids. Animoto is nothing like that and produces very active, professional-grade videos that you can easily edit and share in a matter of minutes. Perhaps that’s why Animoto calls themselves ‘the end of slideshows’. 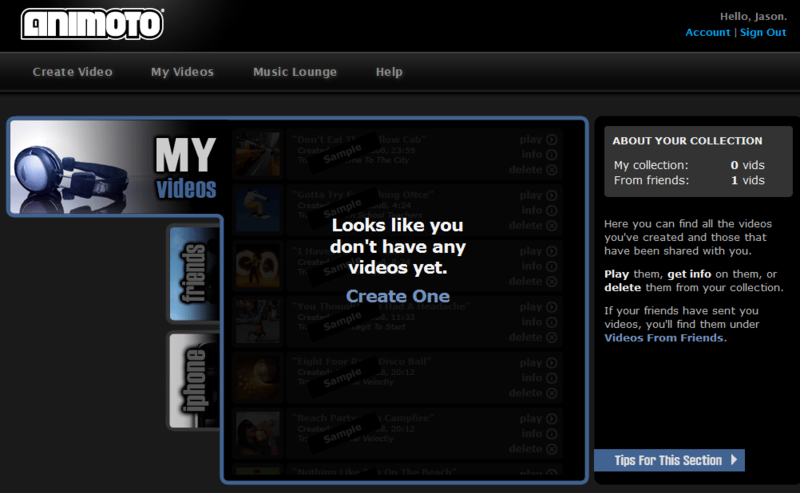 Under the My Videos tab, you’ll be able to play, delete, or see info on videos you’ve previously created. The Friends tab will show you videos that friends have sent you and the iPhone tab (in the future) will allow you to watch videos taken with your iPhone but for now it’s advertising the Animoto iPhone app that allows you to watch your Animoto videos and make new ones. Since we don’t have any videos yet, let’s create our first one by clicking the Create video link at the top. This will take you to a page where you can choose what type of video you want to make. You can only make a Short, a 30-second long video, with a free account. Other options include full-length videos and unbranded videos for professionals along with a few different templates for greeting cards. Let’s create a Short, so click on that button. Here’s where the work begins but once it’s done, you’ll see that it wasn’t much work at all. You simply have 3 steps to complete to create your video. #1. Upload your pictures or videos. With a short you’re limited to about 12 images. You can also select from their collection if you’d like. 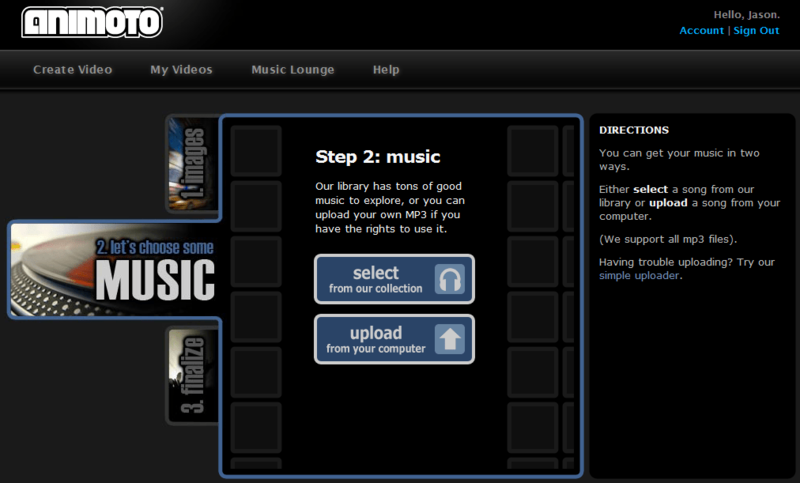 After your media is uploaded, you can sort them in the order you want them to appear or just shuffle them randomly. You can also add text boxes and a few other edits. #2: Choose Music. You can select from their collection or upload any MP3 you have on your computer (and have the rights to). After a file is uploaded, you can specify the Song Title and Artist. You can also edit your song to have it start at any particular point and not just the beginning of the song. #3: Finalize the video. 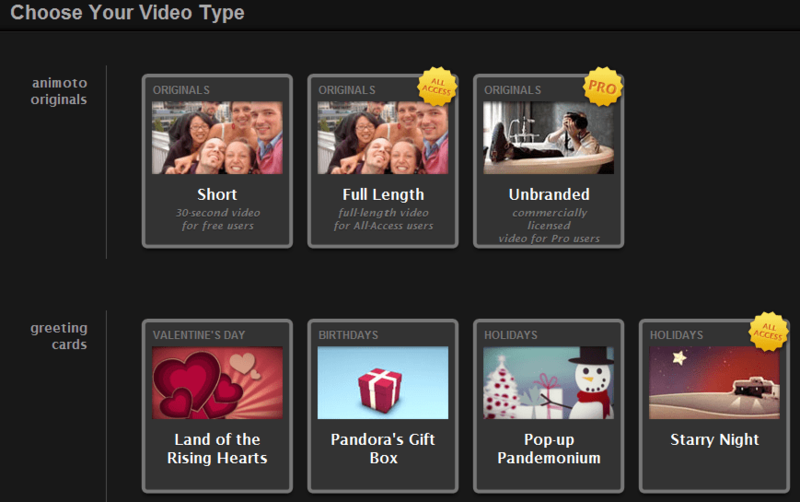 You can choose the video’s cover screen. 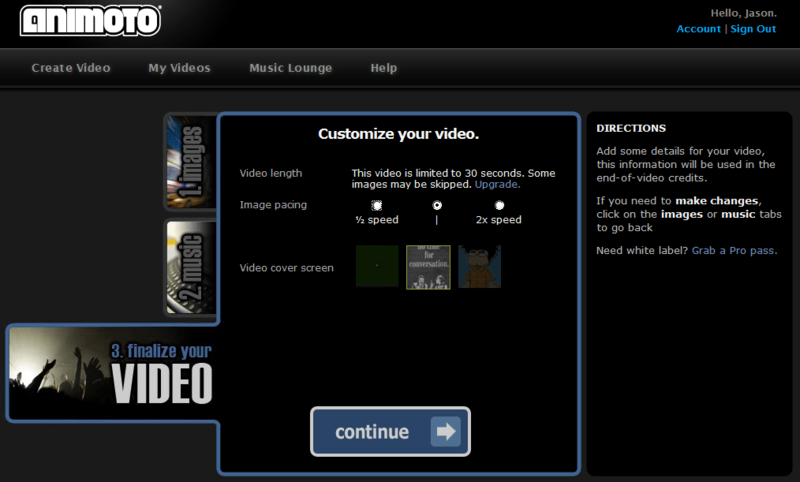 If you have a paid account you can also choose 1/2 speed or 2x speed for your video. 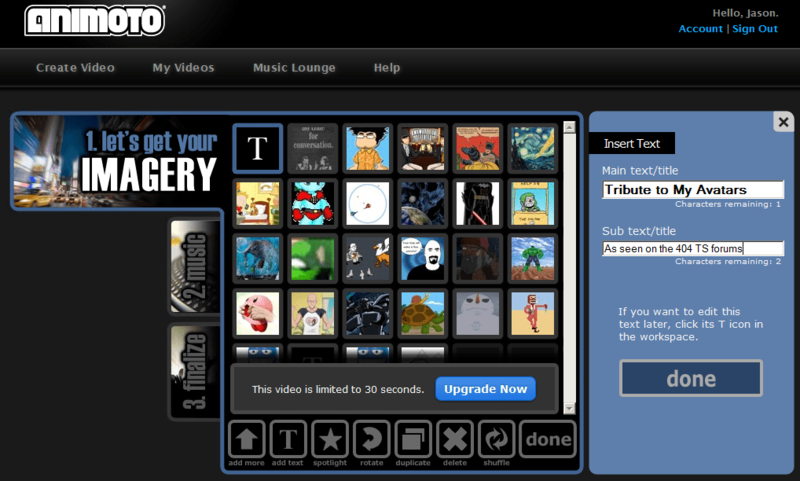 Once you click Continue, you’ll be able to enter a title, description, and Producer name (you!) for your video. After that, Animoto will take over again. All of your work is done. You can leave the window open or close it. 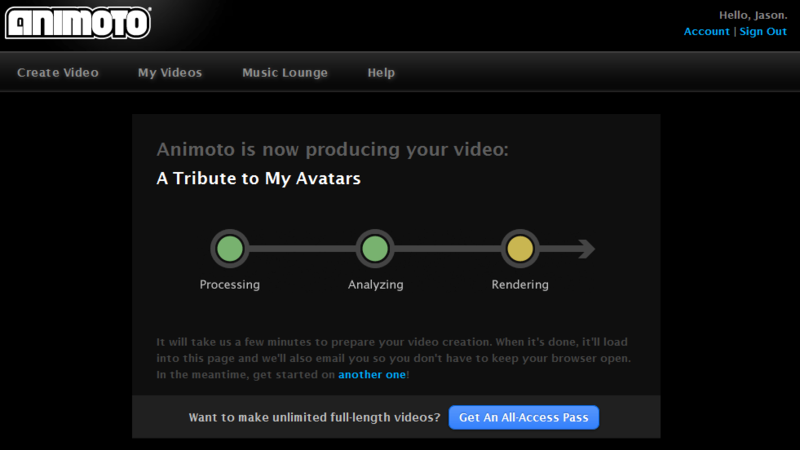 Animoto will send you an e-mail when the video is ready for you. For a 30 second Short, it takes about 5 minutes to render. That’s all there is to it. My video ended up being 34 seconds with the Animoto branding at the end. We can even make a video of making a video with Animoto. You can make full-length video for $3 (with remixes/remakes) when you want to or get a high-res download file of your video $5. Otherwise you can subscribe to get unlimited Full-length videos with an All-Access Pass for a 1-year subscription for $30 or the Professional version for $249/year (or $99/3 months). Animoto could be ideal for businesses, photographers, or real estate purposes. Plus if you’re a non-profit organization or other humanitarian cause, you can apply for a free pro account. Animoto has an API available for cool new things to be made using the Animoto engine. 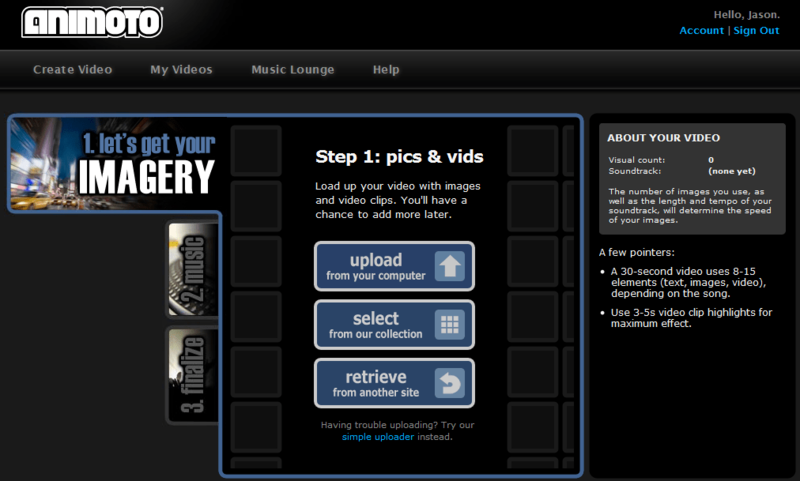 Check Animoto out and go make an awesome looking video from your photos and share it with your friends!